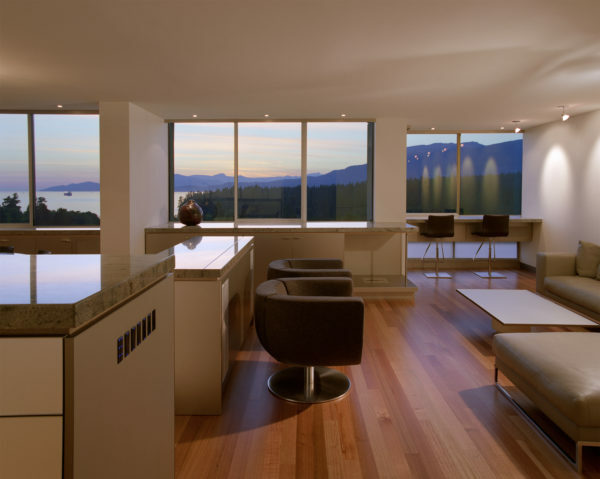 The relocation of the kitchen into the center was the single largest alteration to this condominium unit and fortified the owner’s desire to capture natural light and the tremendous view. The new kitchen established a spatial hierarchy and delineation between public and private spaces. Framed views over Stanley Park and English Bay, along the west elevation, are created through ‘corridors’ established by the existing structural concrete columns. Crisp detailing and a clean material palette enhance the spatial order and unify the spaces.